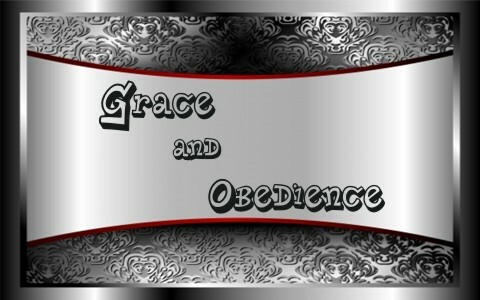 How Does Grace and Obedience Work Together In A Believers Life? We are saved by grace, but what does this mean about our obedience? Does it matter? We are saved by grace, and thankfully, not by works, because most of the religions of the world base their beliefs on works, but God does not. For one thing, our works are nothing more than filthy rags to God and He will not accept them (Isaiah 64:6), and if we add one drop of works to our salvation, we don’t understand grace. The Apostle Paul writes, “For by grace you have been saved through faith. And this is not your own doing; it is the gift of God, not a result of works, so that no one may boast” (Eph 2:8-9), and knowing my heart, I know I’d be bragging about all the good things I’ve done to save myself, but that’s not how it works…thankfully. All I can brag on is Christ and the cross and if we believe our works help us in our salvation, then we’re robbing God of glory because salvation is fully, 100% a work of God. In this way, none of us can boast or brag about how we earned our salvation. How could we, because, “As it is written; ‘None is righteous, no, not one’” (Rom 3:10), and “no one understands; no one seeks for God” (Rom 3:11), so to make sure we understand that none of us are good enough to save ourselves, Paul writes that we “All have turned aside; together they have become worthless; no one does good, not even one” (Rom 3:12), so are works important? Yes, but the fact is, “we are his workmanship, created in Christ Jesus for good works, which God prepared beforehand, that we should walk in them” (Eph 2:10). We’re not saved by works but saved to do works, and these works that we are to walk in, God has prepared for us, even before we existed! Wow. Try to wrap your mind around that. I can’t. After a believer’s been saved, they will still fall into sin, just as an older, more experienced believer will, but the difference is they won’t stay there. That’s because the Holy Spirit is at work in their lives and they actually want to obey God’s law, so they feel led to confess their sin, and get back up, and keep pressing forward, but not because they think they’ll be lost if they don’t, but because they want to please the Lord. When we trust in Jesus, we understand that we owe all to Him, and so out of our love for Him, and being forever grateful, we desire to do for others, with the understanding that it is doing it unto Christ (Matt 25:4). We know we’re not saved by works, but we’re saved to do works (Eph 2:10). Suddenly, we seek to do good works for God’s glory. It’s not our own agenda anymore, although I still like to run things, but anything I do, and it’s best to keep it secret, is going to be openly rewarded someday in the presence of God, but for today, we’ll also have the joy of living an obedient life. Remember how it felt when you gained victory over that thing in your life, whatever it was. You were set free…and there was joy in that. That joy is found in obedience. It’s like God takes holy pleasure when He sees His children living a godly (although, not perfect) life. The grace that set us free can help set us free from sin too. It’s not that we’re suddenly sinless, but we discover, looking back over time, that we do sin less…and that brings joy. Obedience sets you free to live a joy-filled life, but it’s not a blind obedience or obedience because we dread the circumstances (which, by the way, are very real). It flows naturally out of a Spirit-led believer. It shows up in opening doors for people, letting someone else go first at a four-way stop, and it allows others to speak first and doesn’t interrupt while they’re talking. Grace lubricates the life of the believer to a life of good works that naturally flow out of a generous, tenderized heart, but that obedience comes from God, and we are participating with God in this, so, “it is God who works in you, both to will and to work for his good pleasure” (Phil 2:13). When someone says that they are saved, yet have no works to show it, James says that person’s faith is dead. It’s like he is saying, works for God is the evidence that your faith is real, so in a sense, obedience is the evidence that our faith is genuine. It is a Spirit-led obedience, so faith and obedience are not opposed to one another, but in fact, are joined at the spiritual hip. James connects faith and works by writing, “as the body apart from the spirit is dead, so also faith apart from works is dead” (James 2:26). A person can say they are saved, but if their only fruit is bad fruit, then the root is bad, and the whole tree is useless. If anyone claims to be saved, but have no works, then their faith is dead, or, it’s not real. We can’t see the root, but we can see the fruit, or a lack thereof, although some take more time to bear godly fruit than others, but Jesus, in speaking of false prophets, said, “You will recognize them by their fruits” (Matt 7:16a). Further, “every healthy tree bears good fruit, but the diseased tree bears bad fruit. A healthy tree cannot bear bad fruit, nor can a diseased tree bear good fruit. Every tree that does not bear good fruit is cut down and thrown into the fire. Thus you will recognize them by their fruits” (Matt 7:17-20). Grace and obedience are no more opposed to one another than grace and truth. Remember the Apostle John wrote that Jesus was “full of grace and truth” (John 1:14). Imagine if you only had the truth but no grace. Wouldn’t that be a form of legalism? Grace without truth would be licentiousness, which is from an old English word meaning, “a license to sin.” Truth without grace would turn us into walking Bible encyclopedias, where we are constantly beating each other over the head with the truth, but grace without truth will make obedience and works, unimportant, so let grace and obedience walk hand in hand in the Spirit-led believer, and let them produce good works for the glory of God, because God is always seeking glory for Himself, and who better to glorify God, than you and I? Next post: How Do You Approach A False Teacher?